The U.S. Army quietly placed an order for $38 million in depleted uranium rounds last week, bringing the total order from a West-Virginia based company to $77 million for fiscal year 2006, RAW STORY has learned. The munition is highly controversial. While the Pentagon has been ambiguous about its health toll, leftover rounds from the first Gulf War are believed to have caused a significant increase in cancer and birth defects in Iraq. According to a detailed article by the Seattle Post-Intelligencer in 2002, "Many researchers outside Iraq, and several U.S. veterans organizations, agree; they also suspect depleted uranium of playing a role in Gulf War Syndrome, the still-unexplained malady that has plagued hundreds of thousands of Gulf War veterans." The new $38 million order was placed with Alliant Techsystems for 120-mm ammunition. Once the new pact is completed the firm will have produced 35,000 rounds for the U.S. military. 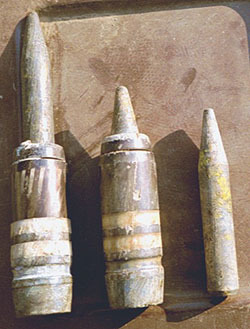 The Pentagon uses depleted uranium in its rounds because they say it is extremely effective in penetrating heavy armor. Depleted uranium remains radioactive for 4.5 billion years. The byproduct of manufacturing nuclear weapons or reactors, the rounds contaminate water and soil. Along some highways in Iraq where the weapon was used during in the first Gulf War, radiation levels register 1,000 times normal background radiation levels. Cancer levels in Iraq are attributed to the shells. A destroyed Iraqi tank in Basra destroyed by the U.S. weapon registered 2,500 times normal background radiation. Read more on depleted uranium in the Guardian here, and from the Post Intelligencer here. In a release, the firm making the weapon said, "Its state-of-the-art composite sabot, propellant, and penetrator technologies give it outstanding accuracy and lethality." UPI first reported on the deal Feb. 20.